The Good Food movement has gained major ground in recent years, driven by fast-rising consumer demand for better and healthier products. One tangible proof of that is in the growing community of investors who are helping Good Food companies start up and grow. One such company is Chicago’s Spiral Sun Ventures, whose tag line is “Investing In Healthy.” Spiral Sun works mainly with small, early-stage companies. 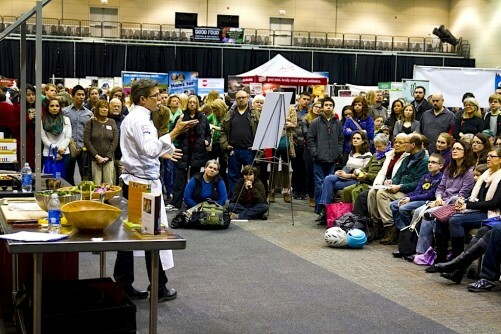 The firm also is a friend of FamilyFarmed, and they exhibited at our 2017 Good Food EXPO. 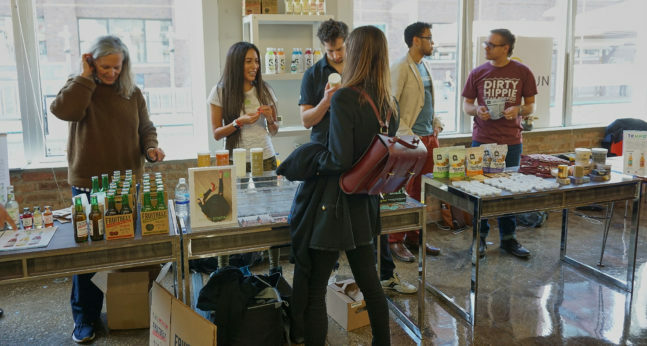 More than that, there are Spiral Sun portfolio companies who also are FamilyFarmed Good Food Accelerator Fellows or regular exhibitors at our Good Food Expo. Spiral Sun holds events for its investors and advisors so they can engage directly with the portfolio companies and hear about their progress. We sat in on one of these events to get a better sense about how this works and the companies with whom Spiral Sun is working. 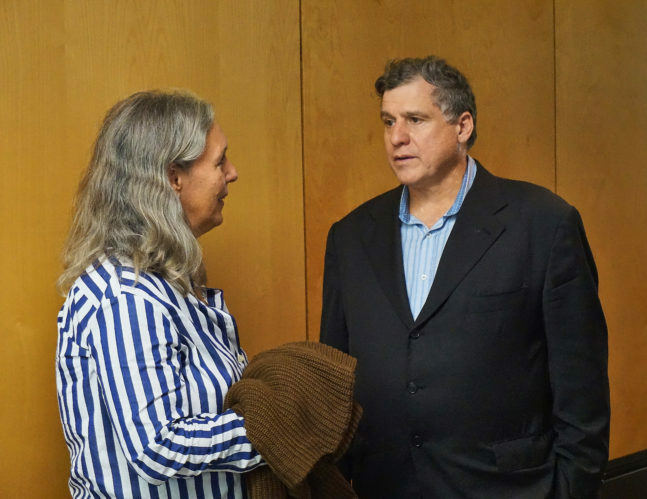 Mark Thomann, a co-founder of Spiral Sun Ventures, chatted with Michele Gazzolo of Fruitbelt — a producer of sparkling fruit tonics and graduate of FamilyFarmed’s Good Food Accelerator — at a Spiral Sun investors event at its downtown Chicago offices. This is not just a measure of public-spiritedness on the part of Big Food companies. It is a matter of financial necessity, as conventional food companies scramble to adjust to a fast-changing food scene in which healthy and delicious food products — produced as locally and sustainably as possible — are eroding the purchasing base of the conventional consumer packaged goods (CPG) industry. 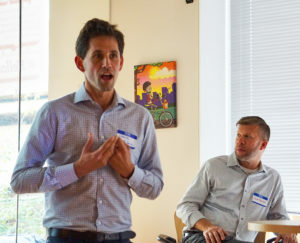 The following is a photo essay of the entrepreneurs and businesses that participated in the Spiral Sun investors event, leading with those who also have a close connection to FamilyFarmed. 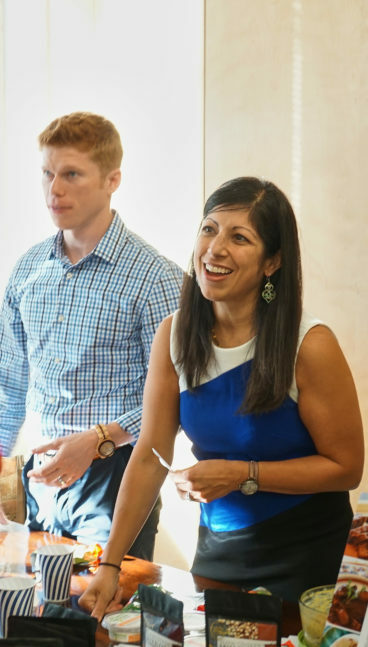 Shibani Baluja of Lil’ Gourmets (right) and Ryan Crane of Tempo Sparkling Tea are Fellows in the current fourth cohort of FamilyFarmed’s Good Food Accelerator. This program annually provides competitively selected entrepreneurs with an intensive-six month curriculum, technical assistance, polished business plans and pitches, and opportunities to network with our extensive networks of food producers, buyers, retailers and investors. Shibani, who started her own company after working for CPG giant Kraft Foods, is producing Lil’ Gourmets brand of fresh, organic, refrigerated baby foods. These products are designed to help expand babies’ palates and accustom them to eating vegetables. The photo above captures three Spiral Sun portfolio companies who also are 2017 graduates of the Good Food Accelerator. Also pictured are Alex French (between Alison and Jordan), co-founder of Bizzy Coffee, which produces handy Organic Cold Brew Double Shots, and Andrew Vrbas of Pacha Soap Co., a company based in Hastings, Nebraska that sells much of its hand-crafted soap products through Whole Foods Market stores. 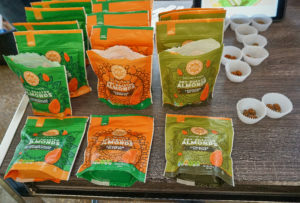 Spice Foods, which packages California almonds with a variety of international seasoning blends, is enrolled in the current cohort of FamilyFarmed’s Good Food Accelerator. Spice Foods is not currently in the Spiral Sun portfolio, but was invited to participate in the product tasting event that followed the pitches to investors. Farmer’s Fridge was a start-up in 2014 when founder Luke Saunders first exhibited at FamilyFarmed’s Good Food EXPO with a bold concept: that on-the-go consumers would buy fresh salads packaged in recyclable plastic jars from its high-tech vending machines. The delicious, chef-driven recipes and the amazing freshness of the salads quickly made the concept a hit, and Farmer’s Fridge is now in a rapid growth mode. The company had about 125 of its refrigerated units in operation around Chicagoland at the end of 2017 — more than double the number just last April — and has three pilot national programs ongoing. 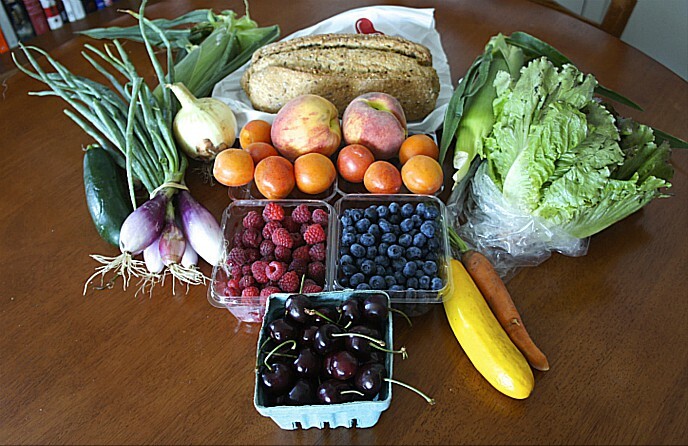 Consumers’ growing health consciousness is helping fuel the rise of Farmer’s Fridge. 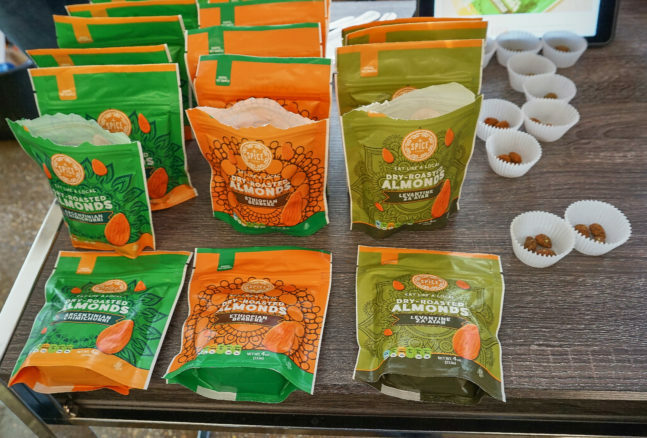 “Food as medicine is very big, and we feel we can incrementally change people’s lives by having this great offering in a very convenient manner,” said Scott Glassman, the company’s senior vice president for sales, at the Spiral Sun event. To read more about Farmer’s Fridge and the boost it received from exhibiting at the Good Food EXPO, please read previous Good Food On Every Table articles here and here. 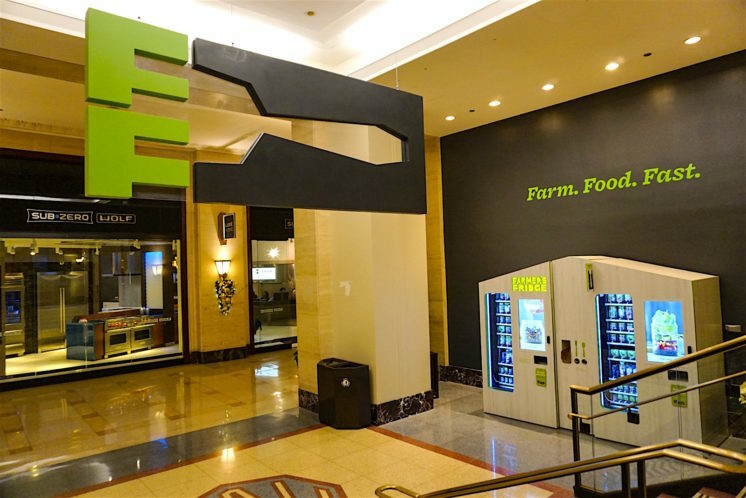 The Farmer’s Fridge location at Chicago’s famed Merchandise Mart is branded and includes seating where customers can eat what they purchase from the machines. COCO5 produces tasty flavored coconut water beverages aimed at athletes and others with active lives. The original product was created by Mike Gapski, head trainer of the Chicago Blackhawks pro hockey team, as an alternative to the popular sports drinks that were heavily sweetened and contained artificial ingredients and dyes. He joined forces with entrepreneur Scott Sandler to create COCO5, which is now the hydrating beverage of choice in numerous professional and college sports locker rooms. COCO5 is currently available in six flavors: cherry, orange, limon, natural coconut, pineapple and passion fruit. Element [Shrubs] is a growing company in a sector that just a few years ago had a tiny niche: vinegar-based drinks. Shrubs, like other fermented foods, are touted for their benefits to gut and general health. And they are finding a growing audience among those who like their beverages (and drink mixers) more tart than sweet. Charlie Berkinshaw, founder of Element, explained at the Spiral Sun event that he and his wife, when they lived in Cambridge, Massachusetts, were members of a group that foraged fruit from people’s backyards. He continued that when his wife was pregnant and could not drink alcohol, she wanted something with the complexity of a cocktail that also was not overly sweet. Out of this emerged first a line of shrub concentrates, which evolved into the bottled beverages, in a variety of flavors, that Element now features from its home base in Arlington, Virginia. This event at Spiral Sun’s offices, in downtown Chicago’s River North community, was certainly not the only time its band of enterpreneurs has done a group presentation. There was a silent auction last April at the Frontera 30th Anniversary Celebration fundraiser, co-produced by FamilyFarmed and the Frontera Farmer Foundation founded by Chef Rick Bayless. Spiral Sun put down the winning bid for an intensive marketing immersion donated by Presence Marketing, a leader in the Good Food space, and used it to provide the opportunity for its clients to have a learning experience and pitch their products. This event last August, held at Presence Marketing’s estate in suburban Barrington, Illinois, produced the following group photo. 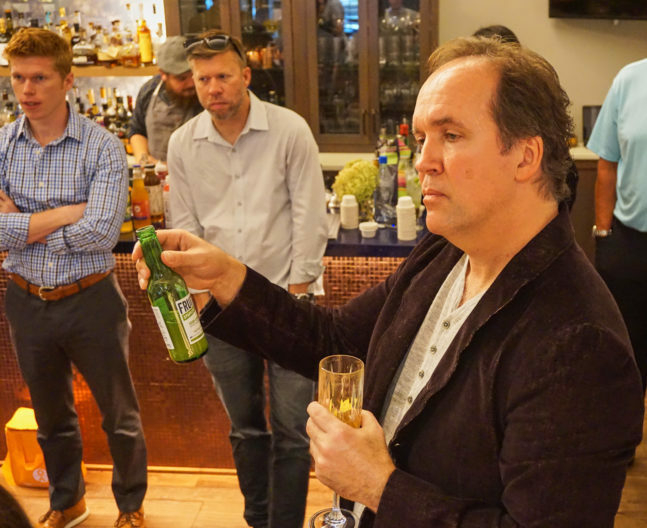 Below that is a photo of Presence CEO Bill Weiland sampling a bottle of Fruitbelt tonic. All photographs by Bob Benenson/FamilyFarmed. Correction: Andrew Vrbas is the owner-founder of Pacha Soap Co. His surname was incorrectly reported in the original post of this article. This entry was posted in Craft beverages, Financing, Food and health, Food Entrepreneurs, Frontera Farmer Foundation, Good Food and economic development, Good Food Business Accelerator, Good Food business development, Good Food Festivals, Good Food marketing, Healthy eating, Sustainable food business investment, Value Added Products and tagged Bill Weiland, Bizzy Coffee, COCO5, Element [Shrub], FamilyFarmed, Farmer's Fridge, Frontera 30th Anniversary Celebration, Frontera Farmer Foundation, Fruitbelt, Good Food Accelerator, Good Food Expo, Lil' Gourmets, Pacha Soap Co., Presence Marketing, Rick Bayless, Skinny Souping, Skyline Kitchen Inc, Spice Foods, Spiral Sun Ventures, Tea Squares, Tempo Sparkling Tea, Whole Foods Market. Bookmark the permalink.